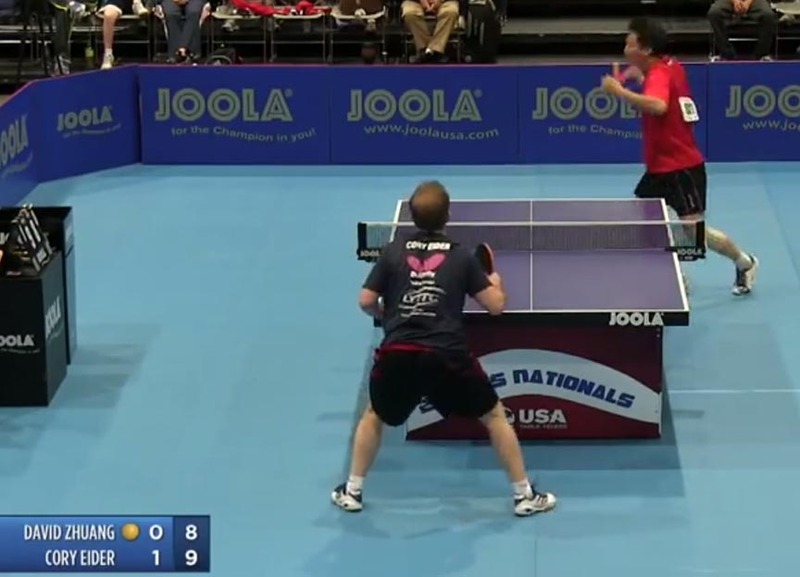 There were a lot of problems with hidden serves at the USA Nationals. For example, in the Men's Singles Semifinals, David Zhuang was faulted several times for this, and I commend the umpire for this. He often pulls his free arm out of the way immediately, as you are supposed to, but then brings it back just before contact to hide the ball. And yet, even there he got away with a few hidden ones. For example, see the service winner at 8-9 in the second, where he ties it up and goes on to win that game, though he'd go on to lose the match to Cory Eider. (Link should take you to 2:43:42 in the video.) Can't quite tell from the video? Here's a freeze frame image. But it was also happening in junior events, in particular by one player in the mini-cadets (under 13). There were several matches where the player's opponent, coaches, parents, and spectators bitterly protested, but the umpires didn't enforce the rule, leading to often comical mishits on the receive. In one match, the player hiding the serve won at 5,3,4. Later the two played again, and this time a different umpire enforced the rule, faulting the illegal server several times in the first game - and this time the other player won. Because I was worried the players I coach would play someone who was hiding their serves, I complained to the deputy referee, who was the acting referee at the time. I know how difficult it is to umpire - I've umpired hundreds of tournament matches and was once a regional umpire - but the rules do say, "It is the responsibility of the player to serve so that the umpire or the assistant umpire can be satisfied that s/he complies with the requirements of the law." (Bold is mine.) Like it or not, that's a pretty specific statement, and means that if the umpire isn't sure whether the serve is hidden or not, he cannot possibly be "satisfied" that the serve complies with the requirements of the law, and has to warn or fault the player. And if a player is hiding a serve, there's no way the umpire can say that he's satisfied that the serve is not being hidden, though of course he might not be sure - in other words, not "satisfied." To my astonishment, the deputy referee insisted that "satisfied" meant only that the player probably served legally, or several other similar vague definitions. When I pointed out that "satisfied" meant "believe something to be true," both he and another referee/umpire argued vigorously with me, saying I was wrong. However, as the Merriam-Webster definition shows clearly, I was 100% right. The pertinent definition is "to cause (someone) to believe something is true." You cannot say you are not sure if the serve is hidden and simultaneously say that you believe the serve is not hidden; that's a direct contradiction. And yet, a number of umpires seemed to believe they could! Sorry, but you can't have both ways. But this was the argument made by the deputy referee and a number of others. My opinion? It's a combination of convenience and group think. It's not an easy rule to enforce since most enforcement of it isn't saying the serve is illegal, but saying the umpire couldn't tell if the serve was visible. And so it's much easier to fall for the group think where satisfied means something other than what it really means. As I wrote yesterday, I Princess Brideian finally told them, "I don't think that word means what you think it means." I then wrote out the exact definition from Merriam-Webster, but I don't think it swayed them. Alas. Things actually got worse after this. I was told there was a video of the player in question serving illegally. The deputry referee refused to look at it. I asked why not. He said, and this is a direct quote, "Because we don't." I point out that was not a reason not to look, and asked three more times, but he would only say the exact same words: "Because we don't." I pointed out that the referees and umpires of every major sport - baseball, basketball, football, etc. - look at video to improve their officiating, but he still refused, and only got angry about my repeated requests for an actual reason. I argued that since it is the responsibility of the referee to make sure that the rules are enforced, how could he not look at a video to see if a player was not following the rules, and then look for a way to make sure they were enforced, i.e. by instructing the umpire to follow the rules? But he refused to even consider looking at a video or watching a match of the player in question. It was like Galileo arguing with church officials to look through his telescope. So we're stuck with many referees and umpires who will not enforce the rules, and worse, will not even look at evidence that rules are being broken. There's no easy way to say this, so I'll say it like it is; they are allowing players to win by cheating. I'm told that at the international level, the umpires are far stricter in junior events, and that hidden serves are faulted - and so some of our up-and-coming juniors may face a shock when they go overseas. However, at the same time, they are lax in international men's and women's events, and so the top men and women often do get away with hiding their serves. It's not a good situation. What do you tell the players to do? If an opponent is hiding his serve and the umpire allows it, then I guess you have no choice but to do so yourself. But it gets trickier - how can a player learn to return such serves unless his practice partners also hide their serves? And so we're stuck with a choice between training all year long and losing to players who are allowed to cheat, or teaching our players to cheat so they can compete. I'd like the referees and umpires who do not enforce these rules to do three things. Explain to parents why coaches are teaching their kids to cheat. The irony is that since the service rule isn't always enforced, many players who do not hide their serve are lax some of the rules. For example, a player I coach got faulted three times at the Nationals because he didn't pull his free arm away as soon as the ball had been projected when doing high-toss serves. He wasn't hiding the serve; he was actually pulling his arm out while the ball was still above his head, but in the umpire's judgment, he hadn't pulled it out quickly enough, and so got faulted. As long as all the umpires are instructed to enforce the rules this strictly, I don't see a problem. Pulling the arm out of the way immediately isn't hard, and no one hides the ball unintentionally; it takes practice to do so. My Tip of the Week on Monday was inspired by these hidden serves: Returning Hidden and Other Tricky Spin Serves. Some players are better at reacting to hidden serves than others, and often this is simply a matter of how quickly they take the ball off the bounce. For example, the player I mentioned above who lost at 5,3,4 tends to take the ball very quickly off the bounce, and so when caught off guard by a hidden serve was unable to react as quickly as a player who habitually takes the ball later. I've always said there are three main ways to hide the serve so that the umpire might not call it. Well, at the Nationals I learned there is a fourth way. Sorry, I'm not going to post a tutorial on these four ways to cheat or how to do them! A month ago I had ordered a packet of the new poly balls, the non-celluloid seamless plastic ones. As I blogged previously, they weren't really acceptable. However, Kagin Lee had several of a newer version (Xu Shaofa balls, also seamless) and he let me and others try them out. Verdict? These ones are usable, and only subtly different from a regular celluloid ball. Even the cracked sound is almost gone. I had several of our junior players try them, and they also said they were usable. One had said of the earlier version, "Unacceptable but fun to use," but these passed both his and my test for usability. So I think this problem has been solved. NOTE added later: I also compared the ball to a Nittaku 3-star, and found them the same size, unlike the previous poly balls I'd tested, which had been slightly larger. I also bounced them side by side, and found the new poly ball had the same bounce as the Nittaku, as compared to the previous version which was faster, i.e. bounced higher. Because of ongoing arm problems, I couldn't loop with any power and so relied on others to judge how they looped, though they looked pretty much like any other looped ball. During the USA Nationals last week I found myself coaching against players from the Alameda Table Tennis Club in California. Afterwards I met coach Pieke Franssen (from the Netherlands), and discovered my blog was responsible for his being there at Nationals with them. Below is an email he sent me afterwards. We met some days ago in Las Vegas. I told you that you and your blog were the reason why I am in the States right now. I saw your post about a northern Californian table tennis club looking for a full-time coach. Then I wrote to them and I came over for a visit to see the club and meet their players. I like it a lot now here and want to return to Alameda to coach if we can arrange the visa. I send you my resume, so you know a little bit more about my background. I hope we will meet in the future again. Best of luck with your center! Here's an article where Ma Long talks about it. Here's the video of the last few points (3:20) - go to 2:53 to see the celebration of all celebrations! Here's Adam Bobrow's poem, with great apologies to Clement Clarke Moore. Here's the video (56 sec). I would say that the issues with hidden serves officiating and with cheating are more significant now than the original issues with hidden serves. After all, we have lived with hidden serves for about 30-40 years in the era of inverted rubbers and spinny strokes, right? Don't get me wrong, I would like to see hidden serves eliminated. But to do that by using an obviously bad rule, which generates a lot of bad feelings and bad atmosphere not just between players but also among players-coaches-referees - not a good idea. Let's be honest - it is virtually impossible to properly enforce this rule. Plus - it is a rule that matters, right? Larry gave a good example when the same two players met in two matches in the same tournament and in one match one of them was allowed to serve however he wanted, and in the other he was not. Difference was obvious and the result has changed. Also, as I mentioned before it is a rule with subjectivity directly written into its language. The rule permits very easy abuse by a referee. Ergo - it is a bad rule. Other option is to force simpler serves. For example - require the serve to be done entirely in front of the server's body. This is obviously much easier to ascertain, especially from umpire's position. 2.6.6.1 If either the umpire or the assistant umpire is not sure about the legality of a service s/he may, on the first occasion in a match, interrupt play and warn the server; but any subsequent service by that player or his/her doubles partner which is not clearly legal shall be considered incorrect. In the quote above, the first bold emphasis IS NOT mine. That is the way it is published by the USATT. The second portion that is bolded and italicized was emphasized by me. The writer's of the rule have provided two additional places in the rules to make it clear that the serve must be clearly legal in the opinion of both umpires in order to be legal. There is no ambiguity here. You really should follow up with the the head USATT referee on this. Good points - I should have quoted that rule as well. Meanwhile, several elite juniors trained all year long for the junior singles and team trials at the Nationals, and lost to illegal serves. It's so sickening. Nowadays, when virtually everybody has a smartphone or PDA on their belt or in their pocket, it is very easy to quickly show the relevant rule to your opponent or to an umpire. Just have the file with ITTF and USATT rules/regulations stored on your phone in PDF format or HTML (even better because it is easier to search it). I know it helped me a couple of times - in an unofficial match this summer my opponent claimed that the net post was considered an extension of the table and therefore when his lob return hit it, he won the point. Within the next 10 seconds I found the relevant rule on my Android phone and showed it to him. He was not trying to cheat, he genuinely thought himself right. Hi Larry, Thanks for standing up for the service rules! I play at the Alameda club and know Pieke and while he replaced a very good coach (who moved to LA) we're all quite grateful to you for helping us find him.